This is a wilderness area with no facilities; this area is not intended for public use. The Pennask Creek Provincial Park was established on April 18, 2001, to protect an internationally significant rainbow trout brood fishery. Pennask Creek is thought to be one of the most important rainbow trout rearing streams in the province. It also protects mature forests of lodgepole pine with some Englemann spruce and subalpine fir. The Pennask Creek Provincial Park is not intended for public use except for low intensity viewing of fish spawning. There is potential for education programs centering on protecting wild fish stocks and their spawning habitat. Pennask Creek Provincial Park contains biologically exceptional trout spawning habitat not to be disturbed by recreational activities. In May and June of each year, approximately 15,000 to 25,000 wild rainbow trout move up from Pennask Lake to spawn in Pennask Creek. Each year, two million eggs are removed from 10% of the spawning female trout and sent to the Summerland Trout Hatchery to be raised. Once raised, these fish are then used for stocking rainbow trout throughout the province. There are four known archaeologicalsites in the protected area and one blue-listed variety of willow shrub, salix boothii. 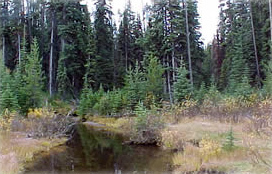 Pennask Creek Provincial Park is bisected by Hwy 97C about 50 kilometres west of Kelowna. Access may be restricted during certain times of the year to protect the rainbow trout fishery.